My relationship with Chile, vaguely and indirectly, goes back to early childhood. In the late nineteen-forties and early fifties my Aunt Helen and Uncle Dave Wright and their children lived in Chile for three years while Uncle Dave worked for the U.S. government. I have memories of seeing them off at the airport and re-uniting with them upon their return, and writing letters to my cousins, Kathy and Maren. Upon returning they gave my parents a gift: a beautiful plate of Chilean copper with the official coat of arms of the country cast in relief and the words 'Republica de Chile'. For many years that plate hung on the wall of our living room. Looking upon it as a child, I often wondered what life would be like in this country so far to the south. During childhood, looking at the shape of Chile on my globe caused me to be incredulous. "How could any country be so long and so narrow?" I wondered. I thought that it looked like a string bean. Later, as I gained experience in surgery during my medical training, I thought of the country as being in the shape of an abnormally elongated appendix with a hook on the end. I've seen many appendices over the years that have had that very appearance. I can't help it and I don't mean this in any way derogatorily, but to me Chile will always be in the shape of an abnormal, inflamed appendix. Over the years a large number of my relatives and friends served missions in Chile, and my Aunt Helen and Uncle Dave, along with my cousins, returned for another three year assignment. Suzanne and I also have developed friends in Utah who are Chilenos. During medical school I had a professor of Physiology who was Chilean, Dr. Ezyguirre. As I became more interested in the wild, beautiful places of the world, I read about Patagonia and Tierra del Fuego in the far south of Chile. I had a desire to visit those places but I dismissed the thought of ever being able to because of their remoteness. Now they are part of our mission area and we will see those areas as part of our assigned work. World's dryest desert. The Atacama Desert in the north goes for years at a time without measurable precip. World's oldest known mummies: 9,000 yrs., discovered in the Atacama Desert. World's tallest active volcano, at 22,383 ft. The strongest earthquake ever recorded anywhere, 9.5 on the Richter Scale, occurred in Chile in 1960. The name 'Chile' is thought to derive from a Quechua (Inca) word meaning 'cold, snowy, deepest place on earth.' The Spanish first called the country 'Nuevo Extremadura', after a province of Spain. Santiago was 306 years old when Brigham Young founded Salt Lake City. The city is named for the patron saint of Spain, Santiago, or St. James. (Used today as a man's name, the word is translated simply as 'James'.) The city was named 'La Ciudad de Santiago de Nuevo Extremadura'. Today it's known simply as 'Santiago de Chile'. It's population is approximately six million. 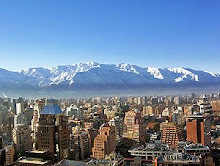 The Andean peaks tower above it, at more than 20.000 ft,. and with perennial glaciers. Although they're only ten to twenty miles away, we haven't seen them because of the smog. We will, however. Very interesting! Chiles history is chock full of very interesting politics! I'm sure you will get to know it all too well. As usual, I enjoy reading your thoughts; Dr. Limburg. I guess that you experience so far has been amazing, and that you can't way to know even more about the rest of the country and it's people. Do take care. Doesn't Chile also have some amazing ancient diagrams or hieroglyphs of sorts drawn in the sands, which can be seen from the air? And are they the country that also discovered a bunch of ancient elongated skulls of primitive peoples? I may be confusing it with Peru, however.